Quick overview Landscape architecture, which includes the planning of parks and gardens and the design and siting of buildings and roads, plays an important role in shaping the world around us. In this Very Short Introduction, Ian Thompson uses real-life examples from around the world to examine its impact throughout history and in contemporary society. Landscape architecture plays an important role in shaping the places in which we live and work. But what is it? Landscape architects are involved, amongst other things, in the layout of business parks, the reclamation of derelict industrial sites, the restoration of historic city parks, and the siting and design of major pieces of infrastructure such as motorways, dams, power stations, and flood defences, as well as the planning of parks and gardens. Taking a historical perspective, Ian Thompson looks at both the roots of landscape architecture and the people that established it. 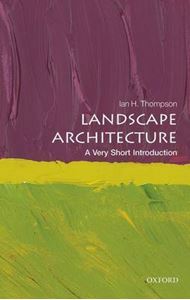 This Very Short Introduction explores some of the misconceptions about landscape architecture and considers the discipline's origins in landscape gardening. Thompson takes a look at a number of areas, including the influence of Modernism, the difference between landscape design and landscape planning, and the way that planning legislation has driven the growth of the discipline. He also explores contemporary environmentalism, the debate as to whether landscape architecture is an art or a science, landscape architecture in the community, post-industrial projects, and its relationship with ecological urbanism. ABOUT THE SERIES: The Very Short Introductions series from Oxford University Press contains hundreds of titles in almost every subject area. These pocket-sized books are the perfect way to get ahead in a new subject quickly. Our expert authors combine facts, analysis, perspective, new ideas, and enthusiasm to make interesting and challenging topics highly readable.